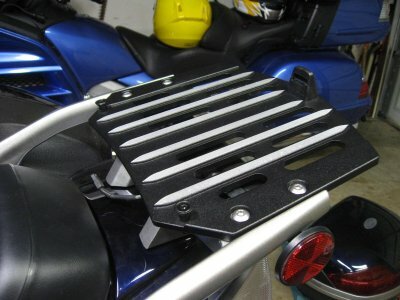 Just wondering if anyone has experience with the all black rack. How will the powder coat holds up over time with a top case mounted. Will the powder coat rub off. Which style rack do you have? I use the all black rack and have a cheap sears box on it for about a year now. There is a foam pad that goes underneath it. So far, if I remove the box and wash the rack it still looks as good as new. 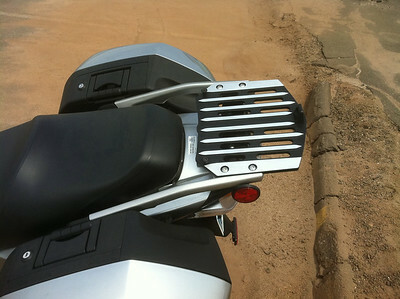 I have the sw givi mount kit on it as well. Same here. I have a Givi trunk mounted on mine. It still looks new if I remove the trunk and wipe the dirt off it. The box won't rub on the black part, it's held up by the polished silver ribs. Powder is a tough substance, it'll treat you well. I purchased the Style "B" rack and it arrived Friday and I installed it over the weekend. This style looks darn good against the silver color of the bike. I prepped the Givi E52, but one of the felt strips shifted and it partially blocking one of the slots and makes for a tight fit. Phil is a awesome to deal with, and is sending a replacement strip so I can fix it up. Should be all set to take the new bike to the Spring Fling rally.